extract all sub-directories as well. emulator runs OK on a P60, slow but playable. pay for DVE ?? I do this for love not money so I don't need the grief. by Ville Hallik (look at the selasnd.c file for further information). the addlib version, for old time's sake I left the above code in. Which emulation you want to use can be configured from the ini file. work when its the fault of a corrupt EXEC image. use, I think it is ok for the games to be distributed with the emulator. I will remove the game images from the archive. them to the site maintainer for inclusion on the Archive. from his site in the section regarding about vectrex game development. If you wish to use a particular game image then. the vector trails become too long. configured as a digital device, this messes up some things i.e Etch-a-sketch. by altering the relevant key maps, these should be speficied as scan codes. what kind of variable each is. not (0). For the majority of you this option is very useless. Lets allways have a 1 here! This should be an unsigned variable, well, doesn't really matter. All modes used are VESA modes. If a linear framebuffer capable card is found, it is used. fiddling with some of the higher settings. Mode number 5 is no 'ordinary' VESA mode. This option relates directly to the option mentioned last. DVE chose to use, perhaps this option helps a bit. this means disabling linear framebuffer usage. Use normal or anti aliased lines. 1 means anti aliased lines (only for fast systems). fast, because it is in the blood of every electric beeing. all electric beeing I know of HATE). yet, so I don't know much about it, I usually leave this to 1. Look at the documentation for some further information. uses. Values from 40000 to 90000 are somewhat meaningfull. The default is 60000 (wise choice I guess). This value should be greater than DISPLAY_UPDATE_MIN. speed, you should be able to do (about) 1500000 ticks/second. uses. Values from 5000 to 35000 are somewhat meaningfull. The default is 7500 (wise choice I guess, though flickery). This value should be lower than DISPLAY_UPDATE_MAX. This also gives the start for DISPLAY_AUTO_REFRESH. to check 'collisions' of lines, the old ones are just deleted. This leaves the screen somewhat garbled (no, not all that much). old lines. This cleans up the display again, at the cost of speed. banked video modes, it might be worth trying without enhancement. the appropriate *.vol file, which override the settings found here. to use for vector drawing (or in old/style overlays). center in the middle of the screen. you can enter divider for both x and y resolution. which overwrite settings found here! you can enter two shifter for both x and y resolution. vectrex. So 100 means 100% of a real vectrex. delimiter is by now a real MUST. The delimiter code is outside the processor emulation. run in little bursts of uninterruptable sequences. 6809 emulation is taking over everything. In the usual vectrex game this doesn't make a difference. interrupts (or the like) will not be correctly slowed down. rates in relation to the speed of the vectrex. (NOT done with SOUND set to 1). If enabled the vectrex state will be saved to a file. "ALT W" and load with "ALT L". automatically loaded when emulation is started. some messages will be displayed during emulation. This is probably of little use to the day to day gamer. how this thing works it is pretty usefull. want to disable DEBUG, for it is a slowdown garant. This setting can be toggled online by ALT D.
If enabled GUI is enabled too! If enabled a MONITOR window will be opened on start. exit function in the Monitor window...). Should the emulator be paused on monitor startup? emulated internally. I call them single and multiprocessor. custom chips are updated internally. Oh well, it says it, doesn't it? Gets the GUI running right from start. You can toggle it using <SPACE> while running. There are now three settings. Only interesting if SOUND is set to 2. For automatic detection (recomended) use 65535. Only interesting if SOUND is set to 1.
for ADLIB volume and DAC output volume. a percentage of the original volume to output. So for really soft output use small values. Well, just what it says. Well, joystick support certainly took its time. Button 1,2,3,4 are also all still mapped to the keyboard. This is only used when the above PCJOYSTICK is set to 0.
analog information the original vectrex joystick was capable of sending. It is (sort of) safer for these games to use this setting. And perhaps a tiny little bit faster (but don't be concerned). and the longer you hold the key, the more 'direction' is emulated. are used to emulate an analog joystick. is decreased back to center, when no direction key is pressed. the direction key. The maximum 'direction' possible is +-32767. A nice value is for example 16. Well these define the keys which are used for each player. list, look at some book, or in the header file 'scandef.h'. It is not compiled into this version. and asked me to implement a continous snapshot feature. BINARY_DIRECTORY (string), values, well a string! The path can be either absolute or relative. VOL_FILE_DIRECTORY (string), values, well a string! PICTURE_DIRECTORY (string), values, well a string! SAVE_DIRECTORY (string), values, well a string! DEV_DIRECTORY (string), values, well a string! ROM_IMAGE (string), values, well a string! Well, the default 'operating system' to load. RAM_IMAGE (string), values, well a string! upon startup, but there is no feature to save one :-). DEFAULT_CART (string), values, well a string! CARTRIDGE## (string), values, well a string! The carousel cartridge names, for ALT F1 to ALT F12...! all correct, non programmers and/or novices - leave it alone! time and inclination to generate a VOL file editor. added a simple pcx routine to the emulator, voila a very lifelike overlay! one for every resolution you would like to play with. For minestorm I include a 'full' overlay. region (if you want to use a vectrexpicture+something as an overlay). Look above for the syntax. NOTE: For x/y values you MUST keep these values exact multiples of 64.
a bit shift to divide. This is for old style overlay definition only! This command allows you to customise DVE's screen colour selection. should always be black (0 0 0). e.g. All other pens have been set to black (0 0 0) on all intensities. coordinates go from about -20000 to +20000 units in both X and Y. Because of the linearity problem described in "Emulation Problems"
some games need a wider clipping box than others (Vaders). This will allow you to shift the 0,0 origin around on the screen. I bet you never looked at it, right? well, the overlay-file scaling overrides scaling values found in vectrex.ini. screen, it moves directly to the other side, as it supposed to be like. emulation anyplace on the screen you like! How about a picture of a vectrex console, and the emulator right on it? You can do it, if you want! command. I would suggest you use pen 15.
if thats what you require. DO NOT ENABLE OVERLAY IF YOU DON'T USE IT!!! The screen will remain black, since no colors are defined!!! with the SCREEN COLOUR command. Enhanced the PCX overlay again (DVE v1.20a). Now some 'shinethrough' or what ever you want to call it is added. parts of the PCX picture. PEN 14 is used for GUI!!! You can use up to 14 different pen colors. are NOT displayed, since they define transparent colors. colors in between the above mentioned are ignored! 'shinethrough' colors for their respectiv pen. a good Idea at the time, can't remember. Perhaps just to add to the confusion. PEN 11, 12, 13 are used by the imager! we have the required intensities for our vector. screen and are visible all time. clipped regions and pixels with transparent colors are none-clipped regions. a extra ram area at $2000-$2800 regarding save files. The only known cartridge to support this is animaction. Emulator behaves like befor the bugfix (I think) regarding color shadings. brightnesses but different colors. Up to 16 colors per overlayblock! This enables lightpen emulation. Lightpen is emulated via mouse. A tiny mouse pointer is shown (one Pixel for now). The mousepointer uses two colors. Color 254 and Color 255 (pen 15 intensity 14 (==254) and intensity 15 (==255)). color if any or all mousebutton is (are) pressed. touching the screen while a button is pressed. This will give you a white pointer and red 'active' pointer. If you enable the lightpen you should enable exact scaling as well. This is not done automatically! divider for exact scaling as a multiplier. Backwards operation of the two shifts is just a bit difficult to manage. file at a certain ftp site (look at links...). Thanks for that again Fred! a spider net arround the last position. If it is found somewhere on the WEB Vectrex is happy :-)! If not it stops searching and is unhappy :-(! Menu (everytime you release the button!). The lightpen will generate an interrupt on the PIA line CA1. ArtMaster scans the whole screen for the lightpen position. It draws lines from bottom to top (search_screen_for_scanlines (0721)). 0x0200 (0766) vectrex coordinates (y-axis that is). horizontal position is done (find_point_of_intersection (076d)). the position it was looking for. be calculated per ticks since last integration. All this makes lightpen emulation sort of inefficient :-(. most of the time emulation goes smooth still. While we are at it... I cheated somewhat here! interrupt is only used by the lightpen (I think). so why bother, I guess it happened with a real lightpen too. For lightpen support I added one further option to *.vol files. not checked whether there is a vector behind the mouse or not. It is checked if there is an overlay section behind the mouse or not. If there is no overlay... the screen is just cleared. because one or more pixel(s) is (are) erased. using the mouse the screen can become somewhat garbled. the '/et', the programm will die of a page fault disease! *.vol file is a GOGGLE-GAME. the wheel has to spin. One tick is 1/1500000 second. tell the emulator, what the wheel looks like. IMAGER_MODE #number# - number between 0 - 6.
is the reason I did things as I did. to reprogram everything from scratch. objectish, as you will notice once you dared looking closer at the source. with it, but for quick 'online' hacks I thought it sufficent. 6809 opcodes and some vectrex OS functions. in the 'help.dat' directory. The usage is obvious. Really tricky things can be done with the help, look at the '6809.txt' help. For some help concerning help files (*.hlf) look elsewhere. some sort of strategy game, but somehow I never got arround doing so. hidden nothing bad should come out of it. not that this feature is anywhere near usable, but it looks sort of <cool> :-). you might at least find semi-usefull. some online help will pop up. buttons. If you do so the former help window will not be closed! If you want to access a hidden window, use the right mousebutton. on to the right button) to move to the next squad..."
planning any further versions unless it is to bug fix V1.0. haven't tried to fix it yet. search on vectors for V1.0 then this should no longer be a problem. default the vectrex skips the opening screen on a warm reset. me an uncorrupted system image. Emulation speed:    P75  approx 30-50% actual speed. that can be done but its a law of diminishing returns. not the fastest but much faster then the watcom libs. why can't DVE hack it, heres my reason why. 300 vectors constantly being updated. fade away, all old vectors then have to be undrawn. very hard to model correctly. places for many games, i.e Vectrex Vaders is much wider than others. different clipping for each game. 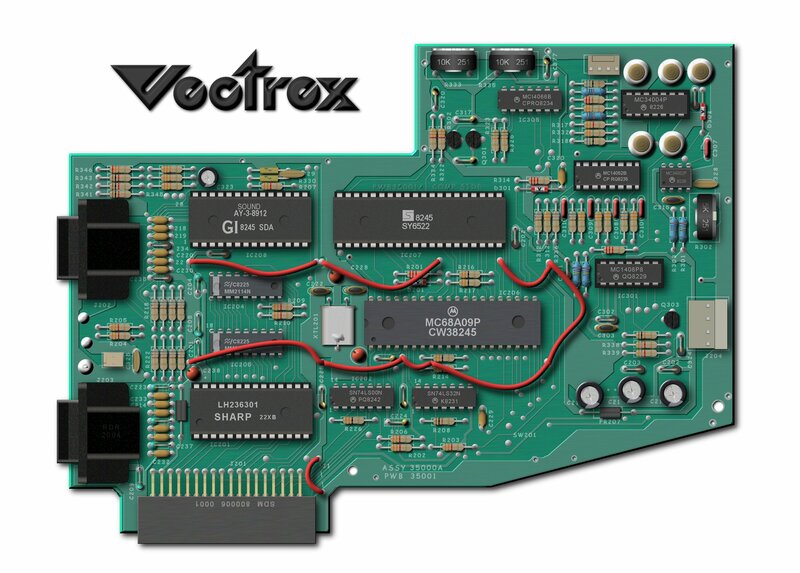 many cycles it needs to reach other vectrex internals. The emulator needs to be 'half-cycle' exact for via emulation! Lee Witek       - For doing the Web page and being an all round mate. Alan Ricotta    - For maintaining the US home page. ago when I started this project. to x2ftp.oulu.fi for setting VESA modes. Brad Mott       - Who licensing text I've borrowed & modified. Marcel De Kogel - For the use of his AY-3-8912 emulation for Adlib. Andrew Bond     - For offering menu.zip for inclusion in DVE distribution. To all of those avid vectrex fans who've sent me email encouraging me. 22/4/96 V0.01 - First public release of the emulator, work in progress. 29/4/96 V0.03 - More opcodes, some bugfixing, some optimisation. 7/8/96  V1.00 - Hashing table added for line search. is found that'll run DVE >100% (P133 or better should do it). data direction register as a RAM location. resolution. That takes nearly 2MB for the highest resolution! Vectrex shows black for any intensity of %1xxxxxxx)"
environment variable must be set! samples (which are written directly to the DSP DAC). 30.06.97:V1.40  - 3d Imager support! Right now I'm emulating a fixed speed for the spinning wheel. yet (dunno if it ever will be...). "Narrow Escape" and "Crazy Coaster" work just about fine. for the other above described settings. probably must find the settings on your own. - support for new printing mode to be introduced in Moon Lander!